From the left window pane of his high-rise office Brian looks out over a cityscape that includes all the normal sort of drab. Drab tarmac, drab concrete, drab roads, drab buildings and drab people. But, if he twists the clear plastic rod of happiness that hangs next to the blind on the right hand side of his window; then his world is transformed. For through the right pane Brian gazes down on a beautiful city garden. A small oasis of greens and blues, of browns and russets, of yellows and reds. Its vibrancy shatters the other window’s greyness into a million slivers of mediocrity. He imagines his window as two television screens. The left, an old 1960’s black and white with a dodgy vertical hold as the cars traverse up and down the roadways. The right, a high-definition, LCD of jaw dropping colours and breathtaking clarity. But Brian is conscientious and in order to get his work done, he keeps the blind on the right tightly closed. He allows the left pane to be unsheathed. The natural light is good and when the sun shines, even though it is black and white, he is warmed. At least physically. But when he needs to feel that physical warmth spread through his spirit, when he needs to feel inspired, uplifted, enlivened; then he frees the colour from its Venetian cell. He turns the translucent rod and waits for the slats to peek open, feeling the joy of anticipation flow through him. He adores that final twist, just as the view is revealed in most of its glory. He savours the fleeting moment yet he knows it isn’t over. The full pleasure is still to come. His view, whilst good, is still obscured by flat metal strips of interruption and so he moves to the last act of revelation. Ever so teasingly, he pulls the cord down and raises the blind, like a ceremonial flag hoisted in honour and majesty. Explicitly drawing out the experience for it isn’t a daily occurrence. He dare not, could not, indulge himself every day. Just sometimes. When he needs the boost. So he treats it like a precious, limited resource that has to be rationed. But on those days like today, when he chooses to gorge himself, he invariably chooses lunchtimes. Lunchtimes are his favourite. Not only does nature relish the full light of the sun but the city workers use her high noon alarm to flock to the idyllic garden. Strolling through or sitting in, reading, eating, looking, being. As each approaches the gates to the garden they pass through and are transformed. From the grey and busy office worker to the kaleidoscopic colour of a boy or girl that rejoices in the grass, the flowers, the trees, the water. They change from black and white to cinemascope colour like the boundary between Kansas and Oz. 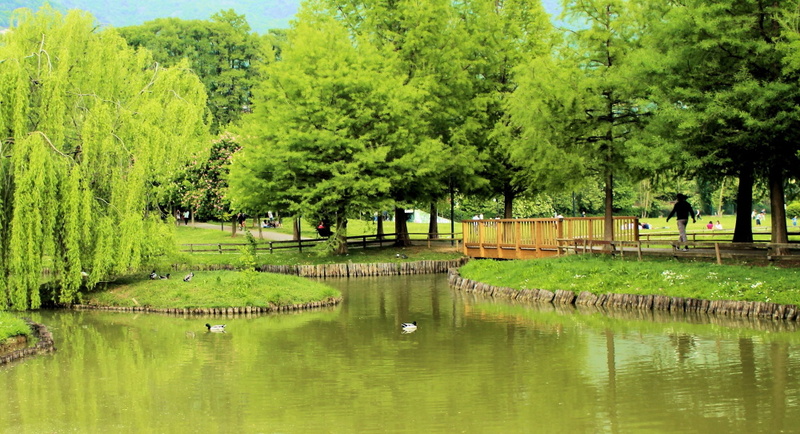 The benches next to the central lake are always full during lunchtimes. The lucky ones, the latecomers, get the excuse to sit on the grass like children at camp. The ducks and ducklings, familiar with the happy people, waddle around like contented parents checking on their charges. Occasionally the ducks will show off their swimming talents by dropping into the water and gliding across to the other bank and back again. A quick hop and on to dry land, a small shake to acknowledge the delighted smiles and shining eyes of their appreciative audience. Brian watches from his high pinnacle and the rays of colour lighten his being. He smiles and gazes and laughs at the antics of the ducks, the reactions of the people, the beauty of the scene. In far too short a time, the people leave the garden. Called and pulled by the unheard, unseen commitment to be adults. Returning to greys, returning to work. Inspired by a renewed happiness for life, Brian also has to return to the day. Lowering the blind in surrender he slows his actions, taking a last glimpse before turning the rod. The ducks, always the ducks. As the slivers of metal obscure the panorama, it is the feathery parents, the graceful swimmers, the hungry eaters, that he will say goodbye to as a last hurrah. They will stay where they are, in nature’s loving caress, sadly watching the people depart from their realm, dipping their heads in a farewell nod to Brian.